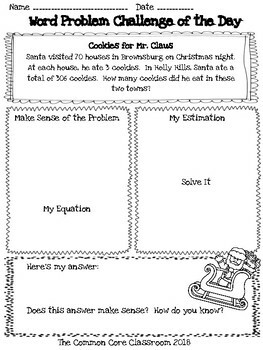 This is a set of 10 two-step Christmas word problems for third graders involving addition and subtraction as well as multiplication and division. While trying to find resources to match the two-step part of this standard, I really struggled so I created my own! 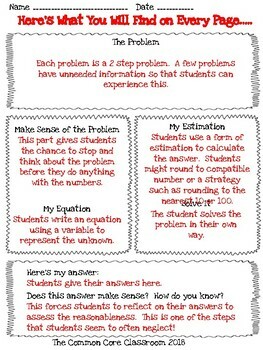 This design slows down students and forces them to analyze each word problem in depth. My idea is to use one problem a day but really go deep. With CCSS, students should be able to write an equation to represent the situation, assess the reasonableness of the answer found, and last but not least...solve the problem! These could be used for independent work, partner work, or cooperative learning. You should use them in the way that works best for your students! Caution: These problems may provide a true cognitive challenge for your students at first. Reassure them that it is actually good to struggle with a problem! They may also need a little scaffolding at first! 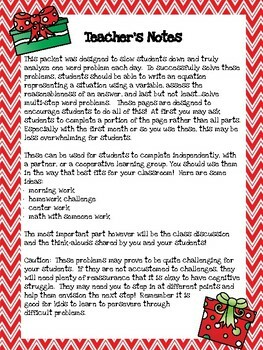 We have packets for second and fourth grade that you can find in our store if you want to differentiate for those that may struggle with grade-level computation or if some of your students need an extra challenge.